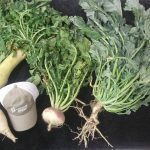 After radishes winter-kill and their large fleshy roots desiccate, the channels created by the roots tend to remain open at the soil surface, improving infiltration, surface drainage, and soil warming (Fig. 2). 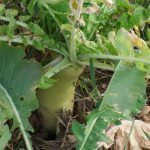 Radish rooting effects on soil porosity also extend into the subsoil. This general process called bio-drilling, can improve root growth by subsequent crops and access to subsoil moisture resulting in greater resilience under drought conditions (Chen and Weil, 2010). After winter-kill (or other causes of mortality), residues deteriorate rapidly. As a result, fall biomass production is unlikely to interfere with spring field work. 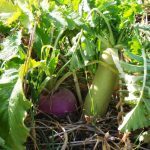 Typically a good stand of winter-killed radishes leaves the soil surface weed free and perforated with open root holes in early spring. 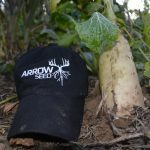 As a result, the soil warms up and dries out faster than soils covered by either winter weeds or a growing cover crop and is conducive to earlier spring planting.